With thanks to Headline Review for the copy of this novel! As always, my reviews are non-bias and fair. Carlotta O'Keefe is happily engaged, and the wedding plans are coming together. She's clear about her future path, both personally and in her busy career. Maybe Chris doesn't make her heart race every time she sees him, but you can't have that feeling for ever. Can you? Then, on a trip to Seville, Carlotta runs into Luke Evans. Luke broke her heart so long ago she'd almost convinced herself she'd forgotten him. Now, he's not that boy any more, but an attractive and intriguing man. And he can explain everything that happened way back when. I've always wondered what Sheila O'Flanagan's novels would be like after seeing my sister read them for years, so when I had the opportunity to read what looked like an amazing read, I jumped at the chance! Carlotta O'Keefe has everything she could want in her life; a handsome doctor-fiancé and a job she loves among the many highlights. Although there are some things she isn't liking about her life right now. Her mother-in-law to be and her sister-in-law to be are judgmental and always put her job down, but the thing that's the worst is the constant comparisons to her fiancé Chris's ex-fiancée. She knows they wish she wasn't in the picture and they could be together again. When Carlotta has to take an important project that's crucial to her career to Seville, she promises to be back before her mother-in-law's birthday party. But a couple of incidents occur that delay her departure. The most startling one of all happens to have the past hurdling back up when she sees Luke Evans, her crush once-upon-a-time. He was quite literally the one that got away. He's different from the Luke she once knew, the one who left in the middle of the night. Even though she loves Chris, she can't stand his family. The new Luke is different in a million different ways, and she's suddenly thrown from what she thought her life would pan out like. If You Were Me is a story about dilemmas, uncertain futures and everything about that future ends with a question mark. Carlotta now has to decide whether she wants the future she planned or something entirely unthinkable. 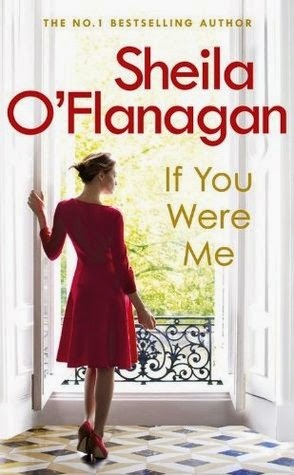 Written by the incredible and highly-talented and much loved author; Sheila O'Flanagan, If You Were Me is going to be on bookshelves in many homes to come. Brilliant! I can't tell the ending, but it was definitely my favourite part by far. Another favourite of mine was when Carlotta meets Luke again after the time and years they had spent apart. Anyone who loves Chick-Lit and Women's Fiction. I'm a Young Adult book fan by heart, but it was a change that I didn't mind - I now see why everyone loves a Sheila O'Flanagan novel! Have you read If You Were Me?